This check collects resource usage metrics from your vSphere cluster-CPU, disk, memory, and network usage. It also watches your vCenter server for events and emits them to Datadog. The vSphere check is included in the Datadog Agent package, so you don’t need to install anything else on your vCenter server. In the Administration section of vCenter, add a read-only user called datadog-readonly. Restart the Agent to start sending vSphere metrics and events to Datadog. Note: The Datadog Agent doesn’t need to be on the same server as the vSphere appliance software. An Agent with the vSphere check enabled can be set up -no matter what OS it’s running on- to point to a vSphere appliance server. Update your <VCENTER_HOSTNAME> accordingly. Starting with version 3.3.0 of the check, shipped in Agent version 6.5.0/5.27.0, a new optional parameter collection_level is available to select which metrics to collect from vCenter, and the optional parameter all_metrics was deprecated. Along with this change, the names of the metrics sent to Datadog by the integration have changed, with the addition of a suffix specifying the rollup type of the metric exposed by vCenter (.avg, .sum, etc.). By default, starting with version 3.3.0, the collection_level is set to 1 and the new metric names with the additional suffix are sent by the integration. The following scenarios are possible when using the vSphere integration: 1. You never used the integration before, and you just installed an Agent with version 6.5.0+ / 5.27.0+. There is nothing specific in this case. Use the integration, configure the collection_level, and view your metrics in Datadog. You used the integration with an Agent older than 6.5.0/5.27.0, and upgraded to a newer version. If your configuration specifically set the all_metrics parameter to either true or false, nothing changes (the same metrics are sent to Datadog). You should then update your dashboards and monitors to use the new metric names before switching to the new collection_level parameter, since all_metrics is deprecated and will eventually be removed. If your configuration did not specify the all_metrics parameter, upon upgrade the integration defaults to the collection_level parameter set to 1 and sends the metrics with the new name to Datadog. Warning: this breaks your dashboard graphs and monitors scoped on the deprecated metrics, which stop being sent. To prevent this, you should explicitly set all_metrics: false in your configuration to continue reporting the same metrics, then update your dashboards and monitors to use the new metrics before switching back to using collection_level. ssl_verify No Set to false to disable SSL verification, when connecting to vCenter. ssl_capath No Set to the absolute file path of a directory containing CA certificates in PEM format. host_include_only_regex No Use a regex like this if you want the check to only fetch metrics for these ESXi hosts and the VMs running on it. vm_include_only_regex No Use a regex to include only the VMs that are matching this pattern. collection_level No A number between 1 and 4 to specify how many metrics are sent, 1 meaning only important monitoring metrics and 4 meaning every metric available. event_config No Event config is a dictionary. For now the only switch you can flip is collect_vcenter_alarms which sends the alarms set in vCenter as events. Run the Agent’s status subcommand and look for vsphere under the Checks section. vcenter.can_connect: Returns CRITICAL if the Agent cannot connect to vCenter to collect metrics, otherwise OK.
Can I limit the number of VMs that are pulled in via the VMWare integration? 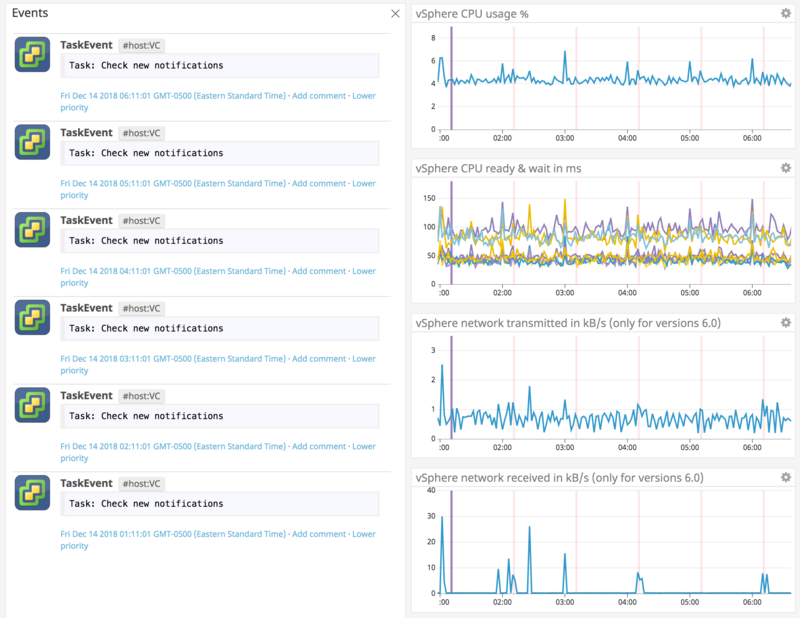 See our blog post on monitoring vSphere environments with Datadog.